Original movie poster designed by the incomparable Saul Bass. 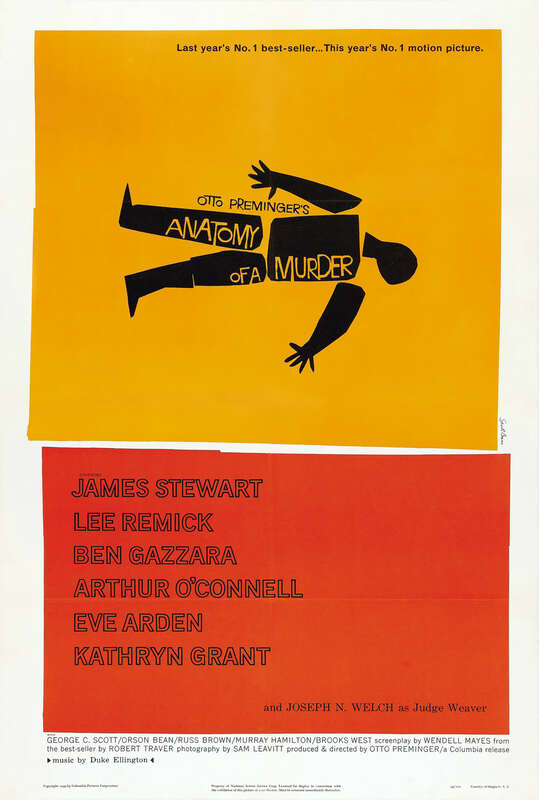 So I’m listening to and watching the 1959 film Anatomy of a Murder once again, yet again, this evening. I often need to watch this marathon of a quiet, well-told tale of murder in Northern Michigan in several pieces. One piece might include the scenes around James Stewart‘s Paul Biegler first meeting his new client (Ben Gazzara as Lieutenant Manion in his jail cell). Another piece might focus on Paul’s first meeting alone (with Maida providing supervision and the occasional commentary) in his home/law offices with his client’s wife Laura, played by Lee Remick in all her tight slacks, little dog lapping beer, knowing innocence-ness. Or I’ll focus on sequences in the courtroom, presided over by the great Joseph Welch as Judge Weaver. Welch, a friend of John Voelker (who wrote the novel upon which this movie is based under his pen name Robert Traver) was an attorney rather than an actor that the world grew to know in the Army-McCarthy hearings in 1954 (“Have you no decency sir? At long last?”). And always a highlight, a reward, for me is this scene that comes close to the end of this three-hour marathon. 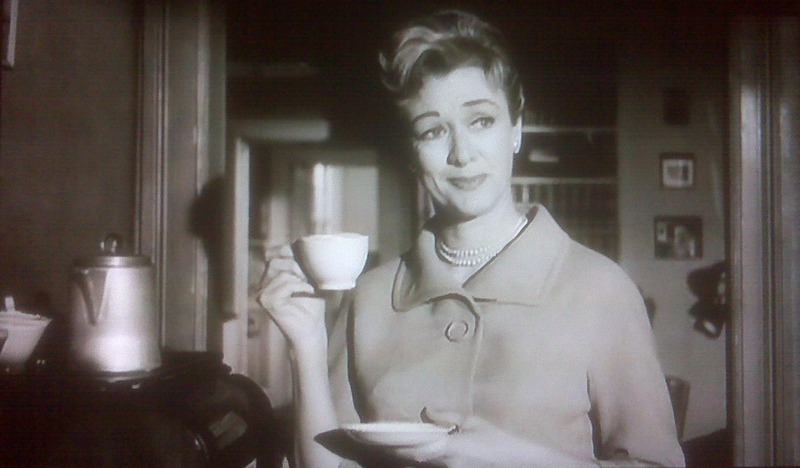 Maida (Eve Arden), Biegler’s s secretary, quietly reflects on why she’s counting on them to win the case — replacing a persnickety typewriter. And Parnell (Arthur O’Connell) chimes in with his musings on the power of the jury system. Arden as Maida. Bemused. I love Arden. Tell me we’re going to win. I’m counting on getting that promissory note from the Lieutenant. I hope we can borrow some money on it. I need a new typewriter. Half the time the ’p’ and the ‘f’ won’t strike on mine. ’Party of the first part’ sometimes comes out ‘arty o’ the irst art.’ It doesn’t make sense. It’s embarrassing. Arty o’ the ‘irst art? I kinda like that. It has a ring to it. Twelve people go off into a room. Twelve different minds, twelve different hearts, from twelve different walks of life — twelve sets of eyes, ears, shapes and sizes — And these twelve people are asked to judge another human being as different from them as they are from each other — and in their judgment they must become of one mind — unanimous. It’s one of the miracles of man’s disorganized soul that they can do it — and in most instances do it right well. God bless juries.